Learn the fundamentals of the game in a group environment with our experienced TSF club coaches. Our focus is to develop a passion for the game, teach the basics and create a platform for athletes to have fun with friends. Our camps take place during the summer and during holidays. 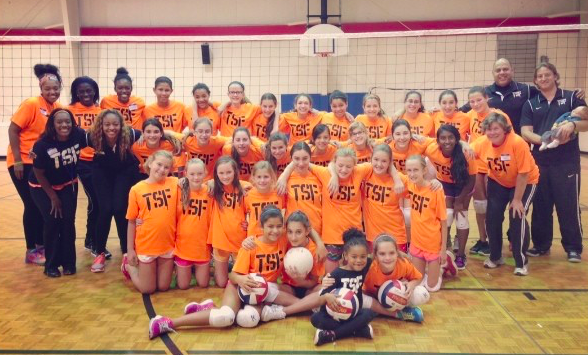 All TSF camps include character lessons, proper warm-ups, skill stations, interactive games and team games. Our camps are a great experience for girls of all ages and skill sets as we group them appropriately and balance learning with developing a love of the game. In a fragmented youth volleyball landscape, The Skill Factory takes pride in their approach to club volleyball. The Skill Factory follows the SRVA (Southern Region Volleyball Association) and USA Volleyball youth guidelines throughout the program and focuses on appropriate practice and growth and less on wins and losses. Players compete in tournaments throughout the southeast including SRVA tournaments and scrimmages if appropriate.